A few brief words are necessary about the countries involved in the studies before describing the results. 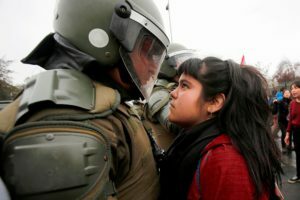 On one hand, Chilean historian Gabriel Salazar has claimed that the use of violence in protests and by social movements has been present across Chilean history to try to achieve social change. The same scholar has also argued that in spite of the presence of popular violence in their history, many Chilean people have often focused their efforts on condemning its use (because of its assumed ‘irrationality’ and supposed criminality) rather than trying to understand why or when some people have considered it as a valid approach. On the other hand, the UK (specifically England) has seen episodes such as the ‘Battle of Westminster’ in 1988 and the riots in Tottenham and Hackney during 2011, where the actions of the police against protesters operated as a trigger for a series of events in which the use of violence became legitimized. Regarding these facts, a group of scholars from this country have developed a scientific approach to understanding the occurrence of riots based on social identity dynamics instead of assuming that crowd’s actions are a product of pathological irrationality. 1 Pings/Trackbacks for "Why do bystanders justify the use of violence by protesters?"